Regular readers will know that I have a penchant for the traditional English breakfast, which should approach the benchmark set by the ultimate breakfast served by Hawksmoor according to the rules of the English Breakfast Society. Black pudding is an essential ingredient for a proper English breakfast. The Wee Black Pudding from Simon Howie has become a big favourite at Tweed Towers. If you haven't tried it, you simply must. 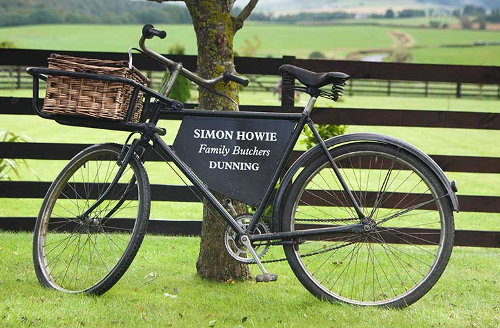 Simon Howie is based in Perthsire, Scotland, with butcher's shops in Perth and Auchterarder, though it shouldn't be too difficult for sassenachs to obtain a Wee Black Pudding. They find their way into Tweed Towers somehow. Your local supermarket may stock them. What is it about this black pudding? All down to the texture and ingredients, old chap. The pudding has a nice soft and smooth texture that grills to a nice crisp outer, but it's the 'caramelised apple and warming spices' that make this pudding sing. Though Simon's pudding has good purchase for hurling into a Yorkshire pudding, perhaps it wouldn't be allowed in the annual World Black Pudding Throwing Championships between Lancashire and Yorkshire in Ramsbottom, Lancashire. I imagine the pudding must comply with certain specifications laid out in the rules of this ancient and noble game. And here was I thinking the video was going to be Ecky Thump!